The Indian government acted furiously after two Indian soldiers were beheaded and mutilated by Pakistani soldiers at the Kashmir border. The fragile peace between India and Pakistan is once again under threat after two Indian soldiers were killed and ‘mutilated’ during fresh clashes at the Kashmir border. India claims Pakistani troops crossed into their territory yesterday and attacked Indian soldiers patrolling in the Mendhar region before retreating. 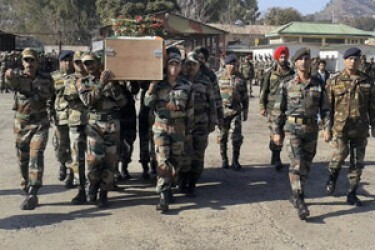 The government said the bodies of the two killed soldiers were ‘subjected to barbaric and inhuman mutilation’ while a senior army officer disclosed that they had been decapitated. Pakistan has rejected the accusations that it killed any Indian soldiers or fired across the Line of Control (LoC) which divides Kashmir. One of the heads is yet to be recovered.